Every fall and winter, with certainty, a percentage of your customers will succumb to a cold or flu bug; every spring hay fever will likely strike an unlucky few. It’s the pits for your clients but an illness creates an excellent opportunity for you to couple kindness with a self promotion! We’re talking about “get well” and “stay well” gestures. After all, you can tell customers how much they matter to you until the cows come home, but showing them with thoughtful gifts tangibly reinforces the message. 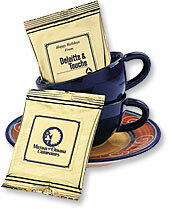 “A little something for what ails you…” A standard mug with your company logo becomes much more meaningful when filled with teabags and soup packets. Or send an imprinted digital thermometer with a get-well card. Keep these care kits in stock to send clients when you hear a telltale cough or sniffle. Complete your caring message with a note suggesting that once your client has recovered, you’ll happily help “cure” business ills as well. “Gesundheit …” There are even an array of options to show clients your concern every time they sneeze. 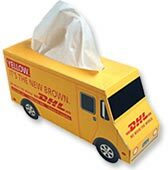 From individual tissue-packets that can be screen printed with your message to novelty-shaped tissue boxes (e.g. those resembling delivery trucks, TVs and slot machines), you can tie in well wishes with the personalized service you provide. Like the concept? Give us a call at 708-478-8222, send us an e-mail or visit us online at www.linjen.com and together we can prescribe the best remedy to boost your customers’ immune systems – and your sales.